Tomorrow, Scrapblog, a hybrid media-sharing and online journal site, will be demoing the new version of their Flash-based online scrapbook application at the We Media Conference in Miami. The public version of the new product will be out in March. Co-founder Carlos Garcia let me in for a quick look around at the redesign, though, and I liked what I saw. 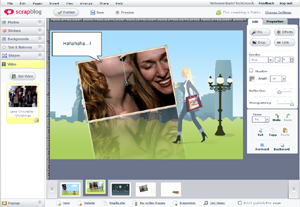 Scrapblog was already a great product. The new version runs more smoothly, has the look and feel of a proper desktop application, and has incorporated more types of media and editing tools. The new version has the same drag and drop functionality of the original, but more closely mimics a desktop application by following the same menu bar metaphors along with a full screen option. They have also beefed up the editing features a bit without making it too intensive for the web. Users will be able to use “edit” and “properties” toolboxes to control transformations on photo and layers, effects, as well as photo cropping. Transitions between frames have also been added (various types of fades and wipes). The release will allow users to import photos from more sites sites, such as Webshots, Photobucket, and Yahoo!. They only supported Flickr previously. Audio and video will also be added to the product. Users will have the option of having songs play along with their Scrapblog slide show and embedding YouTube videos into their pages. You will be able to rotate and scale the videos just like photos. Scrapblog also hopes to have the slide shows import into YouTube as well. Scrapbook pages can already be exported into Flickr accounts. Scrapblog is shaping up nicely and looks to be branching out of the scrapbook niche as it more closely resembles slide show web apps like RockYou, BubbleShare, Slide, Photobucket, and Filmloop. Scrapblog is currently privately financed through Carlos Garcia’s previous company Nobox.